How Many Objects does the Smithsonian Have? | Smithsonian Institution ArchivesHow Many Objects does the Smithsonian Have? Susan Schreiber Counts Sports Team Buttons, by Dane Penland, Acc. No 11-009, Image # 83-5608-34. How Many Objects does the Smithsonian Have? It is a simple answer really: We counted. 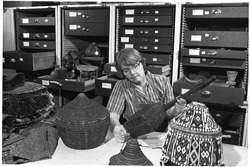 From 1978 to 1983, the Smithsonian undertook a comprehensive inventory of its collections. It was the first time the Smithsonian had ever tried to count each object in its collections and it was a massive task. Over five years, staff from every museum and research center spent thousands of hours counting and barcoding each and every item in the Smithsonian’s collections. In the National Museum of Natural History, this massive project began with weasels in September 1978 and ended nearly five years later with amphibian skeletons in January 1983. Because collections were so diverse, there was no single procedure or process. Each museum, and sometimes each department, created its own system for conducting the inventory. In some departments, the huge research collections that had been built over more than 130 years were practically uncountable on an item by item basis. So, museum specialists estimated how many items were in a batch and each batch was counted as one computerized record in the inventory. 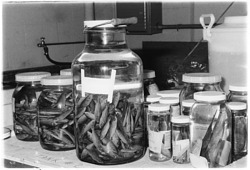 But that batch record might represent thousands of specimens. For example, one batch record of cactus in the Botany collection of the National Museum of Natural History actually represents about 10,000 individual specimens in the collection. By the time it ended, “the great counting” showed that the Smithsonian held about 100 million objects, from locomotives to butterflies. This project was so big that Congress authorized additional funds for the collection inventory, some of which was spent on hiring new personnel to help count. 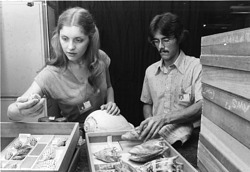 In addition, the Smithsonian used computers to tabulate collections information coming in from all corners of the Institution. The Automated Data Processing program, which ran the collections inventory on a new computerized database system, estimated that more than 200 people, in addition to the permanent staff members, worked on the project over the five years that it took to count each and every item. They found that the National Museum of American History held 4,209 musical instruments and 872,780 coins, while the National Air and Space Museum had 283 planes and 77 spacecraft. The National Portrait Gallery had 1,016 Time magazine covers, and the Freer Gallery of Art held 26,813 objects, just to name a few. While those numbers might seem large, the numbers have only kept growing since 1983. Today the Smithsonian has over 154.8 million objects in its collections.